May I keep my keys when I park? We offer an easy-to-use, online “no fee” reservation system so that you can quickly reserve your parking spot. Not only do we NOT charge a reservation fee (most of our competitors do), we help you to save even more money on airport parking a discount for prepaying. That’s one less thing to worry about when flying out of O’Hare — and the savings can quickly add up. When does your ORD airport parking shuttle run? Our shuttles run regularly to and from O'Hare airport, 24 hours a day. How often do the Park N Jet Chicago airport shuttles run? We operate on a continuous “loop” with shuttles spaced about 5 minutes apart.To O'Hare Airport: It is a 5-to-7 minute drive from our offsite ORD airport parking lot to the terminals. Simply arrive 20 minutes before you would like to be at the airport and leave the logistics of getting to your terminal to us! Pick up from O'Hare Airport: When you drop off your car, we will give you a ticket with a toll free phone number and instructions. Keep that ticket with you during your trip. DO NOT leave it in your car. How do I get a shuttle back to Park N Jet’s offsite airport parking lot? After receiving your bags, follow the red signs to the Bus Shuttle Center, which is centrally located between the domestic terminals, behind the Hilton hotel. When you arrive at the Bus Shuttle Center, go to door #1, and give us a call. We will pick you up shortly after you call. If you arrive from the International Terminal (Terminal 5), go to the outside lane, lower level door 5E, and give us a call. We will pick you up shortly after you call. Our Chicago O’Hare airport parking shuttles run constantly. To ensure prompt pick-up, please call us when you arrive at door #1 of the Bus Shuttle Center, or 5E of the International Terminal. A shuttle will be there promptly if one is not already there when you get to the pick-up location. Do you charge extra for the Chicago airport shuttle? No, this is a complimentary service that is included with our off-site parking. We accept cash, credit card, debit card, and travelers checks. Do you guarantee parking spaces if I make a reservation? If you make a reservation, we will guarantee you a place to park. Reserve your ORD parking spot now. We are open 24/7/365. Whenever you need service, we will provide it for you. Where do I find the cheapest airport parking in Chicago? Offsite airport parking is the way to go for cheap rates — and it’s also a convenient, low-stress option. We are proud to offer competitive long-term parking rates for both our self-parking and valet parking services. In fact, we don’t even charge extra for valet parking — and we do not tack on reservation fees when you reserve a spot as most of our competitors do. 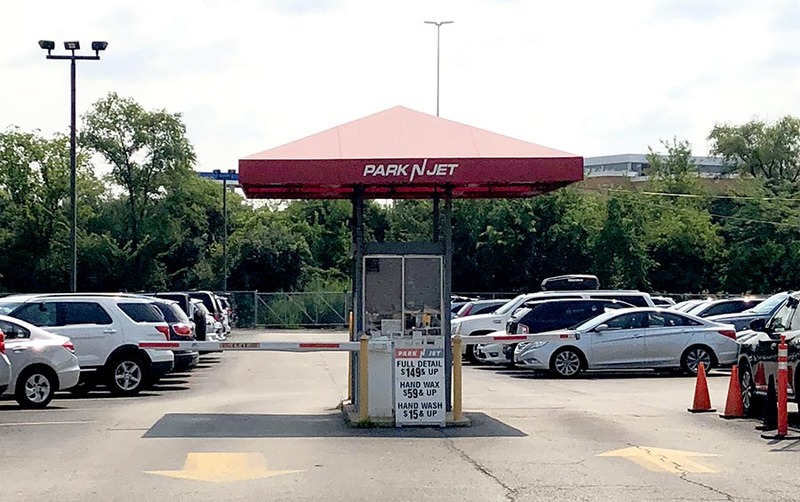 Another way to save money on ORD parking is to reserve your spot and pre-pay at Park N Jet Chicago. With a daily discount for prepaying, your savings add up! Is it safe to park my car at an offsite Chicago airport parking lot? Both our self-park and valet lots are well-lit and fenced. We are staffed 24/7, and our shuttle drivers pick you up and drop you off at your own personal vehicle. What are the benefits of joining your loyalty rewards program? If you’re a Chicago O’Hare frequent flyer, consider signing up for our Frequent Flyer loyalty rewards program. The more you park and fly with us, the more rewards you can earn. Potential rewards free airport parking, coupons or discounts, car washes, waxes, and full service car detailing. Why should I order a car wash with my long-term airport parking reservation? You’ll have enough to do after a long trip, making it smart to come home to a freshly washed, waxed or detailed car. Since we’ll have the car in our possession anyway, our car wash services make perfect sense. Plus, our car wash prices are priced just right! We strive to provide all our customers the best O'Hare Airport Parking experience. We welcome your feedback and questions. For all other questions, please email us at ParknjetFAQ@gmail.com and we will respond in a timely manner.